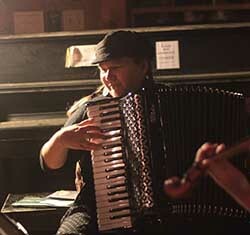 Julie Vallimont performs nationwide on piano and accordion with the bands Buddy System and Nor’easter and other collaborations. She plays for contra, English, and French dancing. A former classical pianist and organist, she fell in love with traditional music and dance, and since then has gone on to perform at numerous festivals and music camps. Drawing on teaching skills developed over fifteen years as a natural science educator, Julie enjoys teaching and leading workshops.